Figs (Ficus carica L.) have been a part of mankind’s daily life for thousands of years. They most likely were one of the first fruits to be dried, and the golden brown fruits are native to most of the Eastern world. Fig trees symbolize fertility, abundance and sweetness. While the fig is generally called a fruit, the actual flower is tucked inside the stem tissue, according to the California Fig Advisory Board. The real fruit are its seeds. The common fig probably originated in western Asia and was distributed by man throughout the Mediterranean area. Archaeologist have found fig remnants in excavations of sites that date to at least 5000 B.C., according to the California Rare Fruit Growers. Figs were first cultivated in India in the 14th century and can still be found there. They came to the United States in the 1700s when Franciscan missionaries planted them in San Diego mission gardens. The fig is the most-mentioned fruit in the Bible, according to the California Fig Advisory Board, starting with the fig leaves that Adam and Eve used for clothing. A Babylonian hymnbook that dates to about 2000 B.C. mentions figs. Egyptians, Greeks, Romans and Asians all believed the fig tree to be sacred. The Romans believed the twin founders of their city, Romulus and Remus, rested under a fig tree. The Roman god Bacchus was regarded as introducing the fig to man. Dried, roasted figs can be used as a coffee substitute. Bakers often use figs because they contain a natural chemical that helps retain moistness in baked goods. According to the California Fig Advisory Board, 1/4 cup of dried figs contains 5 grams of fiber, plus antioxidants, iron, calcium and potassium. They have no sodium, fat or cholesterol. 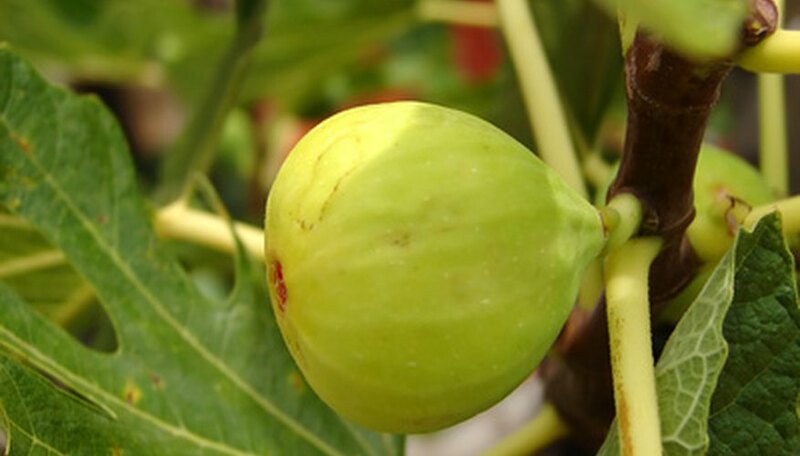 Fig trees attract wildlife that can eat your harvest or damage your plants. Birds love to eat the fruit, and gophers will feast on fig tree roots, which can easily destroy a large plant. The good news is that deer generally are not interested in figs. Figs must ripe fully on the tree before you pick them. If picked when immature, figs will not ripen later. Look for fruit that is slightly soft and starting to bend at the neck. Figs can be stored in the refrigerator for only two or three days.